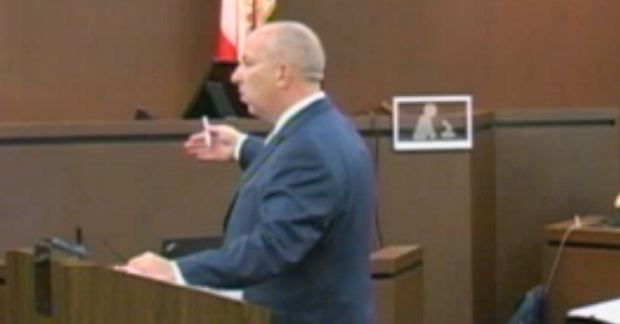 Gary Paige delivers his closing argument on behalf of Jo Freeman in trial against Philip Morris. Gainesville, FL—After one juror rejected a purported verdict and the jury later announced themselves hopelessly deadlocked on damage questions, a state court judge Thursday declared a mistrial over Philip Morris’ alleged role in the cancer death of a Florida smoker. Freeman v. Philip Morris, 2015CA003930. Eighth Circuit Judge Toby Monaco granted Philip Morris’ motion for a mistrial after jurors indicated they could not reach a consensus on whether the cigarette company should be liable for punitive damages in the cancer death of David Freeman, a long-time smoker of the company’s Benson & Hedges cigarettes. Jurors had also indicated during questioning that their professed $3 million compensatory award was an attempt at a compromise with regard to punitive damages. Freeman, 54, died in 1995 of lung cancer that metastasized to his brain. His wife, Jo, claims his cancer was caused by her husband’s decades-long addiction to cigarettes and Philip Morris' participation in a scheme to hide the dangers of smoking. The mistrial declaration ultimately came about two hours after jurors had returned to the court room with an ostensible verdict that was rejected by one of its members during polling. Judge Monaco sent the jury back to deliberate after delivering an Allen charge. However, the jury was ultimately unable to reach a consensus. During Wednesday’s closing arguments, Jo Freeman’s attorney, Gordon & Doner’s Gary Paige, requested up to $10.8 million in compensatory damages, plus a finding that punitives were warranted. Testimony in the eight-day trial focused on when Freeman knew of smoking’s dangers and whether he was addicted to cigarettes or simply chose to smoke. Jo Freeman’s attorneys had contended Freeman began smoking at about 15, the target of a tobacco marketing campaign with an eye toward teenage smokers that dovetailed with a scheme to cast doubt on evidence surrounding smoking’s dangers. They argued that, by the time he knew smoking was dangerous, he was so addicted to nicotine he failed in several quit attempts before his first cancer diagnosis in 1990 drove him to stop smoking for good. In Wednesday’s closings, Jo Freeman’s attorney, Gordon & Doner’s Gary Paige told jurors Freeman’s heavy smoking and multiple failed quit attempts before finally succeeding just a few years before his death ultimately proved his addiction. “If someone was smoking 2-3 packs a day for 30 years [as Freeman did] for 30 years, common sense would say he’s addicted to nicotine,” Paige said. However, the defense argued pointed to periods Freeman didn’t smoke for days or weeks while hospitalized or during quit attempts, as well as his lack of apparent nicotine withdrawal side effects, as evidence he wasn’t addicted. “Why did he smoke, truly? He liked it, like lots of smokers. He enjoyed it. That is the only testimony in this case, why he smoked, from plaintiff, just that he enjoyed it,” Sastre said. Jo Freeman is represented by Dolan, Dobrinsky & Rosenblum’s Randy Rosenblum, Gordon & Doner’s Gary Paige, and Wilner Hartley & Metcalf’s Richard Lantinberg. Philip Morris is represented by Joseph Fasi, of Gass Weber Mullins and Shook Hardy’s Hildy Sastre.